Swindon Town manager Mark Cooper says on-loan striker Wes Thomas could be out for a month with a hamstring strain. Thomas was injured in the 27th minute of the Robins' 2-1 defeat by Colchester on Saturday, their third straight loss. 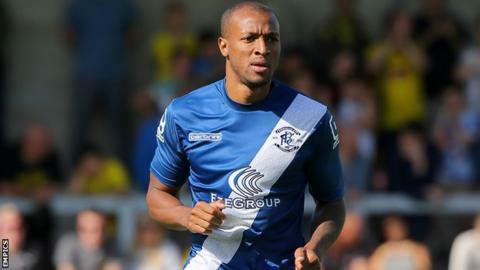 The 28-year-old has scored twice in four appearances for the League One club since joining from Birmingham until January on 1 September. "Speaking to the physio, it looks as though it could be a bad strain," Cooper told BBC Wiltshire. "I don't think we'll be seeing him for a month or so." Cooper also says his side need to increase their work rate if they are to end their bad run of form. "We've just got to work a little it harder to make it turn," he added. "It's the only thing you can do, get your head down and work even harder to try and turn it round and we'll be okay." Meanwhile, Lawrence Vigouroux has been recalled from his loan spell by Premier League side Liverpool, leaving the Robins with only one senior goalkeeper. The Chile Under-20 international made nine appearances for Swindon after joining the club in August.